Order RC Aerodyne's new Chaos 600 size 3D Carbon Fiber mechanics with your fuselage. The successful Hughes 500/MD 500 series began life in response to a US Army requirement for a light observation helicopter. Hughes' Model 369 won the contest against competition from Bell and Hiller. The OH-6 Cayuse first flew in February 1963. The 500 series design features shock-absorbing landing skid struts, a turboshaft engine mounted at a 45-degree angle toward the rear of the cabin pod, a fuel tank cell under the floor and the battery in the nose. The engine exhaust port is located at the end of the cabin pod underneath the tailboom. It has a short-diameter main rotor system and a short tail, giving it an agile control response and is less susceptible to weather-cocking. Hughes won the US Army's LOH contest with its OH-6 helicopter by submitting a very low and aggressive price per airframe (without an engine). Due to rising prices, the US Army later re-opened the contest, where Hughes offered the machine at a more realistic price, but was undercut by the redesigned Bell OH-58 Kiowa (military JetRanger). OH-6 helicopters were still ordered by the US Army, though at a much reduced number. The MD 520N introduced a revolutionary advance in helicopter design being dispensed with a conventional anti-torque tail rotor in favor of the Hughes/McDonnell Douglas developed NOTAR system. Exhaust from a fan is directed through slots in the tail boom, using the Coandă effect to counteract the torque of the main rotor, and a controllable thruster at the end of the tail boom is used for yaw control. McDonnell Douglas originally intended to develop the standard MD 520N alongside the more powerful hot and high optimized MD 530N (both were launched in January 1989 and were based on the conventional MD 500E). 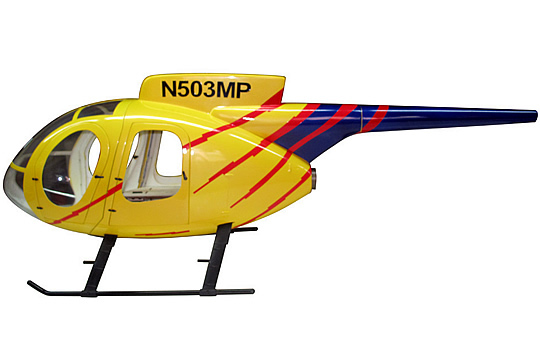 The MD 530N was the first to fly, on December 29, 1989, the MD 520N first flew on May 1, 1990. Development of the MD 530N was suspended when McDonnell Douglas decided that the MD 520N met most customer requirements for the 530N. Certification for the MD 520N was awarded on September 13, 1991, and the first was delivered on December 31 that year. In 2000, MD Helicopters announced enhancements to the MD 520N including an improved RR 250-C20R+ engine with 3-5% more power for better performance on warm days, and, with changes to the diffuser and fan rigging, increased range.